Id been contemplating getting this watch for myself for a long time now, and impulsively decided to treat myself to an early birthday present. I was not disappointed! The mother of pearl is beautiful especially when it catches the light. The fact that it doesnt require a battery as is solar powered was a huge selling point for me. The hands do glow slightly in the dark, although I havet experienced the need to use it in darkness yet so how well lit they are i cant comment. The watch was smaller than anticipated which was a bonus as I was apprehensive it would look to chunky on my wrist. 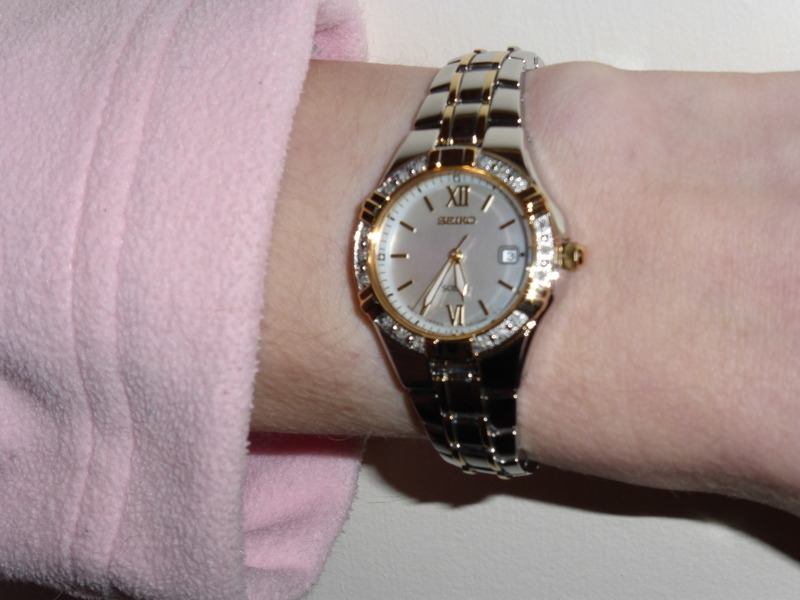 I was proved wrong - I love my new watch! My only grumble would be that despite submitting the note of my wrist measurement for adjustment when purchasing the watch online, it was delivered unaltered. My local Goldsmiths were wonderful though and I cant rate the service provided highly enough. I was concerned about replacing my old Seiko of 20+ years with one bought online - but I am extremely pleased with the watch. The mother of pearl face is incredibly pretty and lustrous - really special. The diamonds are small enough not to be too blingy. I was also concerned about it being solar, and living in damp dark UK, but the Seiko literature I received with the watch has reassured me that it will not run out of power quickly, and is fast to charge up too. The only slight problem for me is the luminous spots on the 12, 3, 6, and 9 markers are very small, and therefore checking the time at night is not easy without my glasses on. \r\nOverall - a lovely watch. \r\nI missed the bit about getting the strap adjusted before delivery, so will take it into the store in town to get it adjusted. Beautiful watch though a word of caution it is much smaller than it appears in the photograph. Nonetheless very pleased with product and service. Bought this for the wife, she loves the quality and feel of the watch. 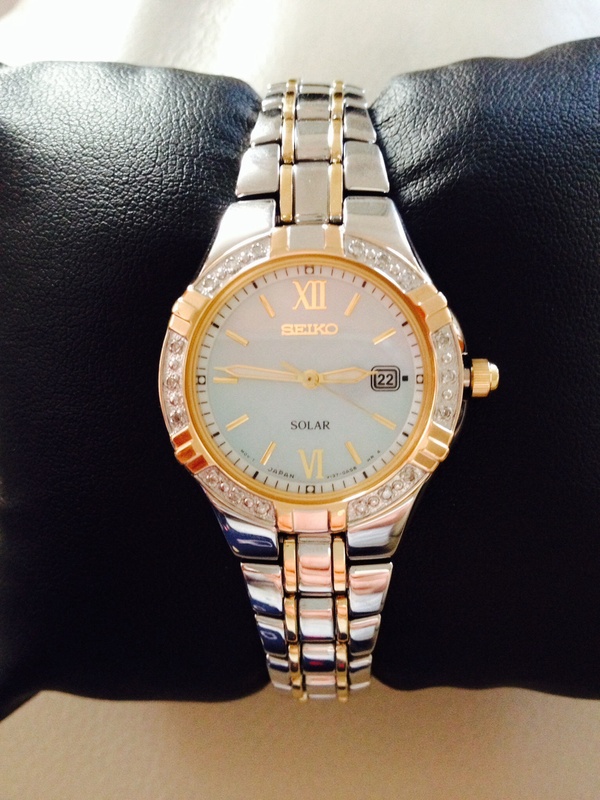 I purchased a ladies Seiko Diamond Solar Powered Watch for my wife as a Christmas present. Although she will not be given it yet, I showed it to her and she was delighted with it, as it lived up to all the expectations from the information and pictures on your Web Site. The service and delivery was brilliant, especially as I had never heard of the watch shop previously. However , my son had, and said they were very good. I would certainly use them again as their range and service was the best I haveexperienced. A delicate yet solid watch. Very attractive face with diamond detail. Easy and clear to read with added benefit of date. Comfortable to wear. Solar powered so do not need to worry about battery replacements. Delighted with purchase and would thoroughly recommend. Beautiful looking watch. Looks better than in the pictures on website. As it is solar powered I didnt know wether it would come charged, but it did. As its solar powered it will take the hassle out of getting the battery changed. Bought as a present for my mum which she loved. Very expensive and elegant looking watch. Excellent delivery. Beautiful. Having not worn a watch for over 15 years I have no complaints about this. Perfect size. Elegant, stylish but not OTT with blind. I ordered click and collect to be delivered in my local Goldsmith branch. They adjusted free of charge and gave excellent customer care. Even gift wrapped the second watch I bought for my daughter. Highly recommend the watch and buying from Watch Shop. Got this for my girlfriend for christmas and she loves it. Perfect size and very elegant. Purchased for my wife for Xmas so do not yet have a feedback, except the delivery was excellent! 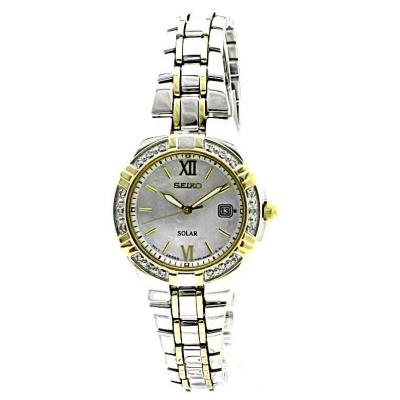 The watch was bought for my wife but I think it is a great looking watch that I think she will really like. Great watch, really fab. Looks good and very expensive too. Would recommend buying this watch for everyday use or a special occasion -cant go wrong, looks good,and feels good, very comfortable to wear and read the time. Absolutely beautiful watch! I bought it as a present to myself as I had received a good pay rise at work recently ...well youve got to treat yourself sometimes havent you! - I had been looking at buying it on and off for a few months but it was slightly more expensive than I planned on spending on a watch but decided to check out the WatchShop website the other night and saw that it had been reduced by 25% which was a good reduction, so went for it! Not disappointed, its great quality and beautiful design. I purchased this watch from The Watch Shop for my wife as a Wedding Anniversary gift, and I am absolutely delighted with it as was she when she opened the box. The solar powering means no trips to the jewellers for a battery replacement, or days when the watch stops working. The design is superb and the overall appearance is one of absolute quality- I would recommend this watch as a FIVE STAR purchase- You will not be disappointed. The Watch Shop service was excellent and extremely efficient.